GAINESVILLE, Fla. — A baby-faced Aaron Hernandez wore an L.L. Bean backpack when he arrived here in January 2007 as a frenzy engulfed the University of Florida. The basketball team hadwon a national championship, and on Hernandez’s first day of classes, the football team won one of its own. Athletes walked like legends among the 52,000 students on this stately red-brick campus dotted with palm trees, live oaks, and tufts of Spanish moss. The bleachers and luxury skyboxes of the football stadium known as The Swamp stretch so high they could seat the entire population of Hernandez’s hometown of Bristol, Conn., and two of its suburbs. The thunderous adulation of The Swamp would help fuel Hernandez’s rise — he became the college game’s best tight end — but also speed his fall. A Spotlight Team examination of his Florida years found new evidence underscoring how the coldly corporatized world of big-time college football indulged and exacerbated the very traits in Hernandez that would one day destroy his life and end others. His anger. His recklessness. His fascination with violence and the violent. His admitted immaturity. Immaturity, in fact, was all but baked into Florida coach Urban Meyer’s plan for Hernandez. He wanted his best freshman players young, and he wanted them on the field early. Hernandez had just turned 17 when he arrived on campus. Six months ahead of his high school’s graduation, he was suddenly a college kid, buzzing down Stadium Road on a silver scooter, working out with the team, hanging out at bars, and finding trouble. Hernandez would quickly learn here that consequences and moral norms — even when a human life hung in the balance — did not necessarily apply to football players. There was no way, except physically, he was ready for this. The young man who came to Gainesville wasn’t academically prepared or emotionally grounded for college life, according to previously undisclosed college records and recordings of phone calls Hernandez later made from jail. He had graduated high school more than a semester early — not because he was a great student but because he was a great football player. Maybe. But Siegmann succumbed, as many have, to the persuasive powers of Urban Meyer. The hard-charging coach had traveled to Bristol. Siegmann said they met alone in the principal’s office. He recalled Meyer telling him that Hernandez “has to graduate” six months ahead of the rest of his class. Meyer was at the forefront of a growing but controversial trend to have elite recruits take summer school classes and finish high school early — a practice that he defended to the Globe in an interview last week. The goal was to start college in January so Hernandez could learn the offense and play spring football. Siegmann and others at Bristol Central had been worried about Hernandez’s mental state since his father’s sudden death earlier in 2006.But the pressure was intense. Meyer had help from one of his Florida assistants, Steve Addazio, a Connecticut native who had initially recruited Hernandez. The two coaches, Siegmann said, told Hernandez how much they loved his talent and his potential to play in the NFL. Meyer and Addazio may not have known all they were getting in Hernandez. The athletic gifts were obvious, but behind them was an angry teenager struggling with an abusive upbringing, a growing dependence on drugs, and questions about his own sexual identity. And this vulnerable young man was entering a realm where the sport had grown into a billion-dollar business that prioritized on-field performance above all else. The classroom, certainly, was a distant second. And he got it. In Gainesville, Hernandez took rudimentary reading and writing courses at a community college, courses that may have helped him but did not count for college credit. Records obtained by the Globe show that many Florida football players who graduated high school early — especially under coach Meyer — took classes their first semester at that same institution, Santa Fe Community College. Football, of course, was the main event. Hernandez found that his childhood sport had become the equivalent of a full-time job requiring 40 to 60 hours a week. Summer workouts and spring practices keep players on campus almost year-round. Another teammate, Jim Tartt, said that while his scholarship provided a free education, he wanted to study agriculture. But Hernandez’s growing prominence in an elite football program also had its perks — perks which, in the end, did him no good at all. It was a world of entitlement, where coaches enabled him, a football lawyer protected him, and fans adored him. Hernandez played on what many consider the greatest college football team of all time with a lineup stocked with future NFL stars. But there would also be destructive impunity, drugs, and the company of bad actors he met through Florida football. This was the time when he snapped a selfie that later went viral — posing in front a mirror, a raised Glock handgun in his left hand. Hernandez worried about the turmoil he held inside. Years later, he told a college teammate in a taped jail phone call that he arrived in Gainesville brimming with rage because of the upheaval in his family. He seemed doomed to find trouble. There were two quick traffic tickets after he arrived in Gainesville — improper passing on his scooter near the football stadium and driving a red motorcycle without license plates. The first real warning sign — and Hernandez’s first lesson about the impunity of football players — came the weekend before final exams. The “freshman tight end” was Hernandez, who at 17 was too young to legally drink and, in the ordinary course of things, should still have been in Bristol finishing high school. Instead Hernandez was in the Gainesville bar with Tim Tebow, the charismatic quarterback who helped recruit him to Florida. Hernandez admitted throwing the punch. He told police he thought a fan had bought the two drinks. Officers did not arrest Hernandez but warned him to expect a criminal complaint. The bar manager suffered a ruptured eardrum, upping the potential charge to a felony — a charge that could derail Hernandez’s football career. Then in the middle of the night, Tebow and Hernandez did something shrewd and “called Coach Urban Meyer,” police records show. Help arrived quickly. Like many elite college football programs, the Gators had an unofficial defense lawyer. Police have joked that Huntley Johnson, a graduate of the University of Florida law school, had a better notification system than 911. The university has denied that there was any settlement. Regardless, Hernandez never faced charges, and the incident did not become public for years. The crime was ultimately inconsequential — a single punch in a college bar. But the lesson Hernandez learned was clear: Even the law knows that football comes first. Huntley Johnson helped keep trouble-prone football players on the field in an era when the Gators had so much contact with the Gainesville police that Meyer once addressed officers at roll call. A running tally of arrests compiled by the Orlando Sentinel during Meyer’s six-year tenure reached at least 31, for offenses ranging from firing an AK-47 in public to throwing food at an employee at a Jimmy John’s sandwich shop. The father of NFL quarterback Cam Newton — another early high school graduate in Hernandez’s class who left Florida after an arrest for stealing a laptop — once described Johnson as the Gators’ legal MVP. Another classmate, Chris Rainey, was a suspect in five crimes but faced charges only once, according to an ESPN investigation that found Florida football and basketball players avoided criminal charges much more often than the public. “If anything happens, we got Huntley,” Rainey told ESPN in 2015. A mile east of the Gators’ football stadium, Johnson’s law office is cluttered with autographed photos of Tebow and framed newspaper articles. One headline boasts, “His Mission: Save Gators’ Hides.” A 2006 National Champions poster bears the inscription: “Huntley - Thanks for being a part of the Team!” Signed: Coach Urban Meyer. Johnson refused to take questions when a Globe reporter visited his office but read a short statement about Hernandez. Meyer told the Globe that he and his staff tried their best to help Hernandez, who they knew had arrived on campus in emotional turmoil. Meyer said he did not recall meeting with Hernandez’s high school principal and “never pushed someone” to graduate high school early, although he sees it as a positive jump-start to college for many recruits. And he minimized his role in bringing Hernandez to Florida, saying it was mostly the work of his assistant coach, Addazio, and that he got involved “in the back half of the recruiting.” Addazio, who is now head coach at Boston College, declined to comment. Asked what he could have done differently with Hernandez, Meyer paused 20 seconds before responding. “I really don’t know,” Meyer said. “I saw a distressed person when he came to our place, we tried to surround him with really, really quality people and we monitored him very closely and then he went on to an NFL career. So I’m trying to think . . . Under Meyer, Florida football soared to new heights, but it came with a cost. “I was addicted to winning,” he said in a 2014 television interview. For the billion-dollar business of elite college football, the real addiction may be money. Top programs are so awash in cash that assistant coach salaries can top $1 million. Recruiters crisscross the country in private jets and helicopters. Revenue rules. The culprit is television. Revenue exploded after a 1984 US Supreme Court antitrust ruling against the NCAA allowed colleges to sell broadcast rights to the highest bidders. To keep pushing for more, elite college football lengthened the season and adopted a playoff system. In the last decade alone, annual revenue doubled to $4.2 billion. Critics lament that all that money has transformed an extracurricular school activity into what is essentially a profit-hungry business that exploits young men. At the elite level, critics argue, college football is broken. Meyer had come to national notice after leading the Utah Utes to an undefeated 2004 season. Florida beat out Notre Dame and signed him to a seven-year, $14 million contract. In Gainesville, Meyer’s recruiting obsession became so intense he texted top high school athletes from his pew in church and the bleachers of his daughter’s volleyball games. One of Meyer’s first big recruiting prizes was Tebow, the quarterback whose grit and skill would win him the Heisman Trophy. Tebow became a brand unto himself — an evangelical Christian who wrote the Bible citation John 3:16 in white on his eye black. Tebow helped reel in the following year’s class of recruits. That included hosting a visit by a young Connecticut kid named Aaron Hernandez. When Hernandez enrolled at Florida in January 2007, it was a heady time to be a new Gator. He posed for a Sports Illustrated photo shoot with Florida’s cohort of eight top recruits who had enrolled in college early: among them Maurkice and Mike Pouncey, who would become such close friends that in prison Hernandez tattooed their initials on his left arm. Of the eight, seven would take classes through Santa Fe Community College . Only two would earn degrees from Florida. But degrees were not the point. Six of the eight made it to the NFL. Hernandez’s teammates recalled a big-hearted clown they called “Chico,” a nickname he embraced. “He always tried to be the life of the party,” said teammate Ahmad Black. He wasn’t a terrible student. His Florida transcript, obtained by the Globe, showed introductory- and mid-level courses and others that sound more like fun: bowling, theater appreciation, wildlife issues, and “plants, gardening and you.” He earned mostly Bs his first semester. But the good times did not mean he was happy. Hernandez wanted to leave Florida. That first semester, Hernandez also showed up unannounced at the Connecticut home of his high school principal. Bristol Central was having a graduation party in the cafeteria and Hernandez wanted to attend. There was so much swirling inside. Few people knew then that he had been molested as a boy or that he had suffered beatings at the hands of his father. Or that his mother had enraged her son by dating his cousin’s husband. Or that Hernandez struggled with his sexual orientation and that he had had relationships with young women and young men. Football has long bred a hyper-macho, intolerant locker room culture. When Hernandez played, there had never been an active NFL player who was openly gay. How would Hernandez, in his ambivalence, fit in with that intolerant culture? Homophobia and misogyny permeated Hernandez’s world. Take teammate Mike Pouncey, who spent so much time with Hernandez in college that he once reminisced they “never left each other’s side.” Pouncey later played a key role in a bullying scandal on the Miami Dolphins in which Pouncey and others subjected a teammate to such withering homophobic taunts that the victim, a 300-pound lineman, ultimately left the NFL. That fall, in his second semester at Florida, Hernandez’s off-the-field life took a startling turn, a foretaste, it seemed, of the future. On Sept. 30, 2007, he was briefly — and it appears wrongly — implicated as the gunman in a double shooting. It was an incident that said something about him, surely, but much more about the skewed priorities of Florida’s coaches. 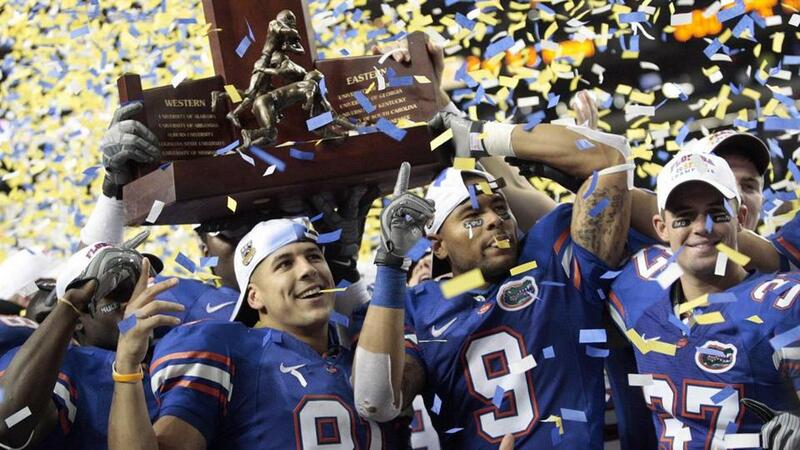 Hours earlier, the Gators had lost for the first time since winning the national championship. Hernandez stood on the sidelines near Meyer and Addazio as a last-second 43-yard Auburn field goal split the uprights. After the game, Hernandez and other Gators walked into a downtown club. He was still only 17, but football players had privileges. At one point in the evening, Hernandez got upset when a guy in a gray tank top snatched a gold chain off Mike Pouncey’s neck. A Florida alum and NFL rookie named Reggie Nelson interceded. Nelson defused an argument. Everyone drove away. Moments later, gunfire pierced the night. The guy in the gray tank top had climbed in the back seat of a Crown Victoria. When the Crown Vic stopped at a light, a gunman on foot fired five shots. One hit the driver in the arm. Another bullet burrowed into the skull of the front seat passenger, Corey Smith. The guy in the gray tank top told police he saw who did it: Florida football players. The gunman, as he described him, matched the description of Aaron Hernandez. Gainesville police Detective Patty Nixon called coach Meyer’s personal assistant and asked for a picture of Hernandez. The witness picked Hernandez out of a photo lineup. Police used his Bristol Central High School portrait, the star dressed in his white and maroon jersey. Nixon told Meyer’s personal assistant that detectives needed to speak immediately with Hernandez and the Pouncey twins. The victim, Corey Smith, was undergoing emergency surgery. Detective Nixon kept pushing coaches to produce Hernandez and the Pouncey twins, but they didn’t arrive for nearly four hours. The Pouncey twins cooperated but denied any involvement in the shooting. So did Nelson, who continued talking after police read him his rights. Detectives saved Hernandez for last. When Nixon opened the door to a small interrogation room, Hernandez had his head down, dozing. Nixon woke Hernandez. Then she read him his rights. That stopped the interview cold — Hernandez invoked his right to an attorney and refused to answer questions. Ultimately, the guy in the gray tank top recanted. He admitted that he did not see the gunman but assumed it had been Hernandez because of the confrontation moments before at the club. Several other witnesses described a different shooter. Police never made an arrest. The victim, Corey Smith, survived, but he had to learn to walk and talk again and still struggles. In an interview, Smith said he believes that Hernandez did not pull the trigger but that Hernandez could have helped police find the gunman. Smith’s mother blamed Florida coaches. Hernandez never told police that he had a friend visiting that night from Bristol, a detail his mother later shared with the Orlando Sentinel. The Pouncey twins also never mentioned the visitor from Connecticut, Nixon said. But knowing what police now know about the role Hernandez’s friends played in other shootings, a visitor from Bristol would have been, “of interest, for sure,” Nixon said. Six days after Hernandez walked out of that Gainesville interrogation room, Smith remained hospitalized. But in Tiger Stadium in Baton Rouge, where the Gators took on top-ranked Louisiana State University, Hernandez appeared ready to go. On third down, coaches gave him the nod. Hernandez ran onto the field to play. Despite high expectations for Hernandez’s sophomore year, Meyer benched him in the season opener, a laugher against Hawaii that Florida won 56 to 10. Meyer told reporters Hernandez did not get himself ready to play. “That was the code for failed a drug test,” said Pat Dooley, a longtime Gainesville Sun columnist. The coach later acknowledged that Hernandez did, in fact, fail a single drug test. For the first offense, Florida’s penalty was a one-game suspension and additional testing. A second failure would have cost him six games. After a third, Hernandez would be gone for a year. It was no surprise Hernandez failed one test, but how did he not fail more? Hernandez smoked so much marijuana he later told his lawyer that at Florida “every time I was on the field I was high on weed.” In a recorded jail call, Hernandez reminisced with his mother about rolling marijuana blunts with his stepfather and two Florida teammates at a Gainesville hotel. “You’re crazy, like your mother,’’ Terri Hernandez told her son. None of it mattered. The next week, Hernandez caught a quick 14-yard pass from Tebow. After one tough loss, Tebow led Florida to eight straight blowouts. The Gators jelled that year with phenomenal athletes, big personalities, and old-fashioned fun. The season over, classwork should have been the focus. But after making the conference honor roll as a sophomore, Hernandez struggled academically in his junior year, earning a D in a course about poverty and an incomplete in his second attempt at intro to statistics. But grades, by this point, did not matter. Hernandez had a monster junior season. In his last home game, after scoring a second touchdown, Hernandez added an exclamation point, heaving the football high into the frenzied stands at The Swamp. Florida fell just short of another championship. Hernandez won the Mackey Award, recognizing him as the best college tight end in the country. The young star seemed to face a choice: Play his senior year or enter the NFL draft. Meyer did not respond to allegations in Baez’s book, but Meyer acknowledged persistent rumors about Hernandez’s drug use. “But the tests would come back that he was not smoking and he denied it all the time,” Meyer said. On draft day, the first tight end picked was from Oklahoma. Then the Patriots picked tight end Rob Gronkowski. In all, five tight ends would be selected ahead of Hernandez. In his first year in the NFL, he would be paid about $500,000 less than the tight end picked first, making Hernandez a steal for a team willing to overlook trouble off the field. One team had a reputation for taking that kind of chance. It had a thorough look at Hernandez in college. The team’s coach, Bill Belichick, was close to coach Meyer, and Belichick had been seen watching Florida practices. Finally, in the fourth round, with the 113th pick overall, that team made its decision. The New England Patriots called the name Aaron Hernandez. Spotlight reporter Andrew Ryan can be reached at andrew.ryan@globe.com. The Spotlight Team e-mail is spotlight@globe.com.